Cooley Middle School robotics/applied technology teacher Joe Bisaccia and Chaparral fifth-grade teacher Marcella Cochran are two of 150 teachers to receive the Wishes for Teachers grants this year. They were selected out of more than 4,200 applications. Fiesta Bowl CFO Curt Krizan took the news to the two teachers during class time in early December. Both teachers received a $5,000 grant for classroom supplies. Bisaccia is a first-year teacher at Cooley Middle School. Bisaccia started teaching as a long-term substitute while waiting for law school admission, but fell in love with the field and became a certified teacher. “It’s been a great experience and I feel really fortunate to work at an awesome school like Cooley in such a great district!” he said. Cochran is a 13-year veteran teacher who has worked in Higley for six years. With her grant, Chaparral fifth-grade teacher Marcella Cochran hopes to purchase items for her classroom to help improve student focus. “Our fifth-grade students have recess before school, if they arrive before the bell rings, and a 15-minute lunch recess. I have been looking for ways to incorporate quiet movement and flexible seating in my classroom so my math students can take care of their sensory needs,” she said. To do this, she is looking to purchase flexible seating options such as wiggle seats, stability balls, adjustable desks, balance boards, resistance bands and more. “It is my hope that taking care of their sensory needs will improve their ability to focus in class and in turn, improve their success in math,” she said. 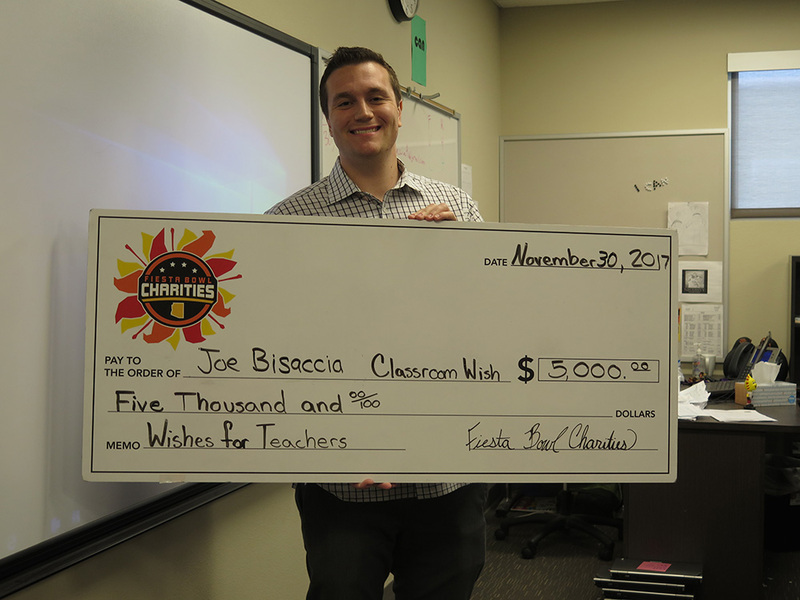 The post Fiesta Bowl grants $5K wishes to two Higley teachers appeared first on AZEdNews.